When twitter recently added a “Suggested Friends” feature, I was more than a little disappointed. Unlike Facebook’s “People You May Know” feature, no explanation is provided for why these people were suggested. In an enterprise setting, the most valuable people are the connectors: “The people who know which people know what”, according to Alan Lepofsky of SocialText. The larger the organization, the more likely someone else is working on the same problem. And the less likely you’ll find them. Automatic “Friend Suggestions” shift the connector role from people to software. These suggestion algorithms can use all sorts of data, from mutual friends to similar content (if we both tweet the same thing) to match relevant people. If you have the data, there’s a million ways to slice it. But every attempt I’ve seen seems mediocre at best. While touring IBM’s Innovation lab at Lotusphere last week, I was surprised to see IBM is also tackling this problem with their “Social Networks & Discovery” project (SaND for short). And it looked FAR better than anything I’ve seen previously. 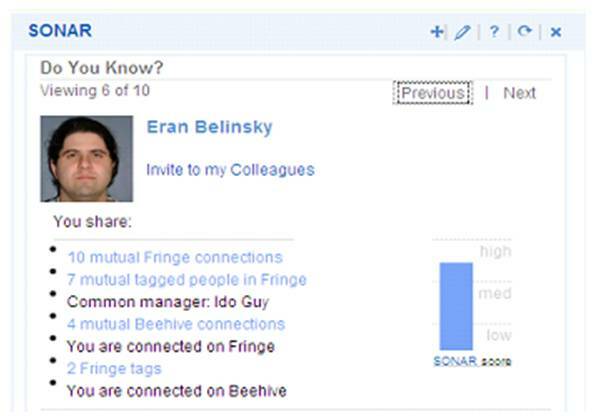 Their relevant person suggestion engine (screenshot above) uses mutual connections across multiple networks, shared knowledge tags, and even values certain connections above others (like a mutual boss). Perhaps even more interesting, the IBM aggregation and filtering system works on any entity in a system–people, textual documents, or meta-information (tags). Like Google, searching on any term returns a ranked results list. But unlike Google, pausing over a link shows the relationships between people, tags, and documents (screenshot below). As I tweeted earlier this week, I rarely read RSS anymore. Too much content, too little time. As this information proliferation grows–on both sides of the firewall–filtering relevant people and content will only become more necessary. This is still in the research phase, and isn’t shipping in any IBM products yet, but I expect to see it in Lotus Connections fairly soon.